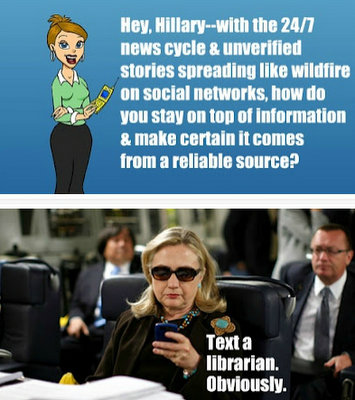 I've been thinking a lot about public libraries/organizations and social media lately, especially on the differences between Twitter and Facebook. I wanted to jot down some notes about what I think works and what doesn't, & figured I'd share them publicly so that folks can do anything from heartily disagreeing with them in the comments to potentially benefiting from them. 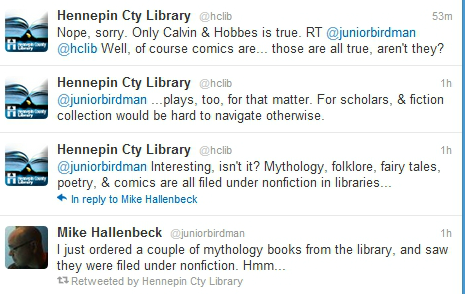 I've had a personal Twitter account and followed libraries with it since fall of 2007, but have only recently started tweeting for a library system (about a month now). I still have a lot to learn, but I've also learned a lot. These notes take the form of advice, and it's advice I stand behind, but I'm not claiming to be an expert (highly recommended, by the way: this Geek Girls Guide podcast episode on The Cult of Social Media, which covers, among other things, how often "social media expert"/guru/maven is invoked and why it is often a misapplied phrase). *Don't import your Facebook status updates into Twitter. A lot of library systems do this, so I want to take some time to explain why I think it's not a good practice. First off, here's what it implies about why you're on Twitter: "Why are we on Twitter? As an afterthought, to make sure you know what we're doing on Facebook!" If I want to know what you're doing on Facebook, I'll like your Facebook page and look at it regularly. I won't long follow your Twitter account if you clutter up my stream with badly-formed not-quite-tweets. People are on Twitter for tweets: 140-character or less bits of info (or things other than info, but still: tweets). Facebook statuses aren't tweets (unless they're 140 characters or less--some of those might work in both arenas). Importing a Facebook status, with no re-editing to make it work for Twitter, often results in ellipses followed by a link--and often what's preceded the ellipses gives no real indication of what you'll find by clicking the link (so why would you take time to do so?). Sometimes the ellipses come at a particularly awkward or embarrassing point, too, like the one I saw about an author visit that started out slowly describing the speaker: Name of Writer is from blah blah blah, where he was a son of a...[link] Sonofagun. A half-formed, imported-from-Facebook, awkwardly-trailing-off tweet is also rendering itself unretweetable from the get-go. I know I would never retweet one. Retweets aren't the end-all be-all, but they do help spread the word (inspiration flash just after watching Hunger Games a few weeks back: retweets are the mockingjays of social media). If time and resources are the issue--you don't have enough to manage both a Twitter and a Facebook account, and that's why you import Facebook statuses into Twitter--choose one and drop the other. I honestly think it's better to not be on Twitter, period, if you're not going to write/tailor every tweet for it (read: if you're not going to do a wholehearted job of it). If you tailor some tweets, but import others from Facebook, drop the importing and tailor them all. If you're a public library and have to choose to stick with only Facebook or only Twitter, my reluctant advice is to choose Facebook over Twitter. I think Facebook is less interesting than Twitter, & offers less opportunities to be proactively of use to patrons--but more of your patrons are on Facebook. More of everyone's users are on Facebook. *Never, ever, tweet just a link with nothing else. This looks like spam. Actually, this kind of is spam. *Don't tweet immediately after signing into Twitter. Watch your stream roll by for a few minutes first, to catch the mood. Maybe check what's trending, too--if there's a natural disaster going on, or a shooting in your area, or the death of someone many of your followers are mourning in their tweets, it's not the time to interrupt people's streams with a tweet about your Hunger Games diorama contest. Just wait a few minutes. *Don't rapid-fire tweet a bunch of events in a row. After tweeting one event, wait at least ten minutes before tweeting another. Think of what it's like on Facebook when your newsfeed contains several posts in a row from the same person...after a few, you just want to scroll down and see anything else by anyone else. *Don't address tweets to people that aren't on Twitter. I've seen library systems tweet things like "Kids! Come to our" etc, when it's pretty unlikely kids are following them on Twitter. Instead of using kids when tweeting about children's events, use families. *If one of your followers asks a reference question to the ether--not directly to you, but to all of her followers--and you can quickly and confidently answer it, do. "What phone should I buy?" is not a reference question. "Does anyone know the name of that book about ghosts they talked about on NPR yesterday?" "Does anyone know which local stores sell [a particular product]?" "Can YouTube videos I upload be made private or are they public for everyone to see?" are all reference questions. Answer them and provide a link to your source. I can imagine lots of folks disagreeing with this one, arguing that you shouldn't answer unless you're directly tweeted to. I've had only positive experience with the approach so far, but it's true I've only had a month of experience. It just makes sense to me: if you can quickly and accurately help, do. I think of it kind of like roving reference. When you rove, you take a walk around the library, and sometimes you hear a patron saying something to her child like, "I wish I could remember the name of that series you liked last summer about the magic puppy," and because you happen to hear it, you can answer it, even if they never would've thought to approach the desk for help. Situations like these are one reason I wrote above that I think Twitter offers a unique opportunity to be proactively of use to patrons. You can't "overhear" questions like this as easily on Facebook. With Twitter, the stream is right there. *Tag organizations and people you partner with for events when tweeting about that event. It's courteous (you're promoting them, too, not just your library), and chances are high they'll retweet it, getting the eyes of more potential event attendees on it. Don't know their Twitter handle, or if they even have a Twitter account? Take a moment to Google & find out. *Weed the list of those you follow from time to time if you're using autofollow (the option to automatically follow everyone who follows you). Autofollowing's fine, but spammers and ad blitzing accounts will find you and follow you just to raise their number of followers (many will unfollow you soon after they do so). This leaves you with a feed full of bunk--which, if you don't intend to pay much attention to what your patrons are doing on Twitter, but just to blast tweets out like a news bulletin, is fine. If you want to be able to glance at your stream from time to time and see what your patron followers are tweeting about and might be in the mood to hear about from you, weed out the bunk. *Follow your patrons. I don't think you need to follow every account that follows you, but follow your patrons. Don't miss this easy way to get a feel for what interests them and how you might better serve them. You don't have to watch your stream closely all the time, but you should look at it from time to time, and it should include your patrons. *Tweet when your followers are active. If you sign into Twitter and none of your patron followers (assuming you also follow other libraries, media accounts, etc)--the ones you want to deliver your tweet to--have tweeted anything for twenty minutes, save the tweet for a busier time. *Look up the official Twitter hashtag if you're tweeting about a national or international event--there usually is one. For example, it's currently National Volunteer Week and a number of folks are tagging their posts #nationalvolunteerweek12. That's 24 of 140 characters spent (not that you always need to tweet to 140, but). A quick Google search on "national volunteer week hashtag" calls up the official tag: #nvw12. I understand feeling a bit of reluctance to attach a hashtag whose meaning followers might not immediately recognize (as they would the longer #nationalvolunteerweek12). I've been feeling it about #npm12, too. But ultimately, I think going with the official hashtag is best: you're providing context in the rest of the tweet; if not knowing what #nvw12 stands for bothers a follower, she can simply click on it--and doing so may lead her to more worthwhile tweets on the topic. She may be glad to have learned the correct hashtag. *One simple thing you can do to add value to your account for your followers is to create public lists of relevant local resources--the Twitter version of subject guides. Create a "Local News Media" list, for example, or "Local & State Government," or "Local & Literary," "Local Arts & Theatre," etc. Then let your followers know that the lists are there to help them quickly find and follow local accounts relevant to their interests. A few will subscribe to the lists. Some will glance at them and find a few new accounts to follow. Will everyone use them? Of course not, just like the large percentage of patrons don't subscribe to RSS feeds of new ebooks. But, as with the RSS feeds on your website, you have added value. You will have shown those who do use them that you (meaning your organization) are a source of discovery, know things worth knowing, can make their lives (or at least their Twitter experiences) richer. I also advocate creating private lists for yourself (or the team working together on your Twitter account). One private list I've created is simply "Admired Library Accounts"--accounts I want to keep a special eye on because I can tell they have a lot to teach me about best practices for libraries on Twitter. Another is "Sources for Content"--orgs local and otherwise that tweet things I think will be valuable to our followers and that I might mine for retweet purposes. When a kid comes up to the ref desk and asks if we have graph paper, I point her to this site. There are lots of little things like this we (and I'm betting you) use at the ref desk: online-convert.com , fillanypdf.com , etc. They're the sorts of simple timesavers librarians know about. We can (and sometimes do) link to them on our website, but a lot of people don't mine our website and will miss them. So tweet them from time to time. You'll be giving tips to people where they already are, not asking them to come to your website to find them. Like public lists, many will overlook tips, but others will favorite them and come back to them to utilize them over and over. Again, you've been a source of discovery. All for now. I intend to do a second post on what voice and brand consistency might mean across wildly different social networks with wildly different audiences, but I'm not ready yet. What do you think? 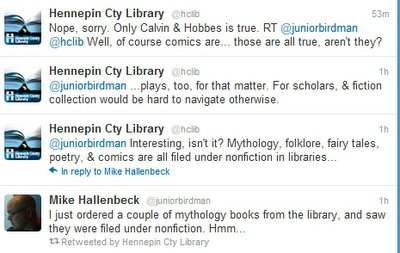 What ideas do you have about best practices (or plain old dos and don'ts) for public libraries on Twitter?